This vision of the sun may seem both very close and remote, aloof yet deeply personal, welcoming and intimidating. One thing is certain: the dominance of the star in this mythical landscape is overwhelming, and it will affect the viewer in one of these ways or another. As was often his custom, Edvard Munch created several versions of the piece, all derived from a similar premise; he varied the colors, sometimes dramatically, to run a gamut of effects. Often psychological, here these effects can also assume the straightforward meaning of a landscape changing during the time of day. It is a violent image — the rays cut and slice through space — and there is something menacing in how they cover and occupy the surface. It’s as if they try, like a spider’s web, to catch anyone trying to study them. Lines play an important compositional and conceptual part: piercing and deep, they run through the entire canvas as if trying to break out and continue beyond it, generating an effect of pulsating speed — the speed of light — that overpowers the observer. The web of rays clashes with the calm instilled by the rocks and the beach, while the fitting scoop-like shape of the shore barely contains it. 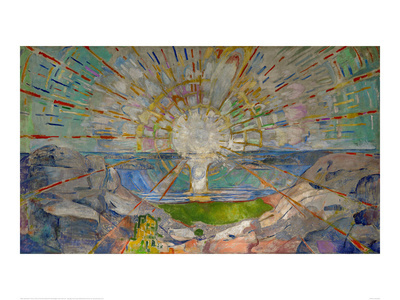 Two interrelated compositional levels emerge: the first taking shape above the center of the painting, mostly in yellow and white, formed by the circle of the sun and the yellow radial grid, and the second consisting of the outside landscape, which absorbs all the colors of the rainbow. It seems that the former bright epicenter produces the most visual energy (not unlike in an atomic explosion), whereas the rest of the piece works to dissipate and contain it. This is a classic hot versus cold palette juxtaposition put to a compositional (and psychological) effect. The sun and its reflection produce the shape of a light bulb, which could allude to the use of artificial light — though there seems to be much more supernatural than simply artificial to this image. It’s as if the artist wished shake the viewers, cast them out of their comfort zone (the serene beach and the rocks) and confront them with a powerful all encompassing element, dangerous and unpredictable. There is something iconic, in a religious sense, about this sun; an underlying energy that evokes ancient creed and rituals. It’s an enigmatic and complex painting (somewhat reminiscent, for instance, of El Greco’s View of Toledo, or Vermeer’s View of Delft — though both artists made the city, not an abstract landscape their theme), and somewhat out of character for the generally figurative artist. I love this painting not only for the illuminating sun but for the flowers present on the bottom right hand corner. An unusual symbol of hope present in an Edmund Munch work of art.